Two presidential announcements in one day rocked the University of Miami community Monday. Not only was the new president of UM revealed, but former Cane, Senator Marco Rubio, entered the 2016 presidential race. The 43-year-old freshman senator is the youngest contender. He joins Ted Cruz and Rand Paul in the race for the Republican presidential nomination. 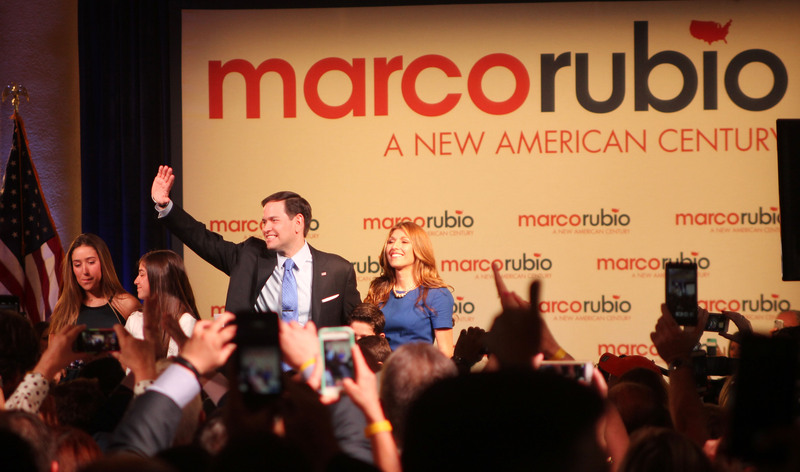 The Freedom Tower in downtown Miami was packed with supporters, family and friends of Rubio. “Marco, Marco, Marco,” the crowd chanted when he entered the historic room filled with American flags and even a projection of blue and white stars from the flag on the ceiling. The energy, buzz and excitement in the air extended to an overflow area outside the tower, where supporters were able to watch the announcement live on a large projection screen. As a Cuban American, Rubio chose to announce at the Freedom Tower for reasons close to his heart. The Freedom Tower, Rubio said, serves as a symbol of the nation’s identity as the land of opportunity. He spoke about his parents achieving the “American Dream” and how it no longer seems like a reality anymore. In a country defined by equality of opportunity, he said that should not be happening. His plan: Reform the tax code, reduce regulations, control spending, modernize immigration laws, and repeal and replace ObamaCare, so that the American people can create millions of better-paying modern jobs. He also spoke about creating a 21st century system of higher education, the importance of family, that all life deserves protection, and that all parents deserve to choose the education that’s right for their children. He discussed the U.S.’s role in foreign affairs as well. “If America accepts the mantle of global leadership … by ending the near total disregard for the erosion of democracy and human rights around the world, then our nation will be safer, the world more stable, and our people more prosperous,” Rubio said. Rubio also couldn’t help but take a jab at Democratic candidate Hillary Clinton. The room exploded with cheering with the news the crowd had been waiting for. “That is why today, grounded by the lessons of our history, and inspired by the promise of our future, I announce my candidacy for President of the United States of America,” he said. Junior Olivia Blacketer attended the announcement and left filled with excitement and hope. Blacketer said she thought Rubio’s speech showed that despite what the critics say, he is ready to be president. Sophomore Jimmy Kardys joined the crowd outside the Freedom Tower to watch the announcement live. He said the announcement came as no shock. “I’m surprised he didn’t announce earlier,” Kardys said. “Overall, it was a thrilling experience. I really enjoyed it. CORRECTION: A quote by junior Olivia Blacketer was incorrectly attributed. This story was updated at 1:56 p.m. on April 15 to reflect the change.